Es Paradis is a five bedroom Premier Villa. The stone clad country residence is set in the heart of the beautiful unspoilt s'Horta valley affording truly magnificent undulating views across almond and olive groves towards verdant hillsides and the distant sea. This mini countryside estate has a small private vineyard and olive grove producing excellent wines and olive oil. 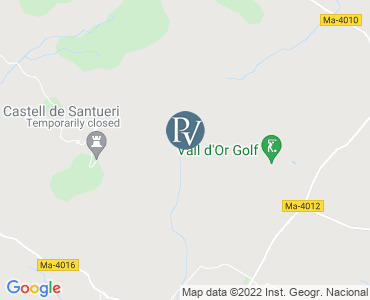 It’s very peaceful and private location is ideal for a totally relaxing holiday amidst Mallorca's natural verdant countryside of winding lanes lined with wild fennel and rosemary. The attractive dining room has seating for 10 persons and a doorway to a covered terrace affording those views. There is a fully fitted kitchen with dishwasher, microwave, electric oven/hob, fridge/freezer with ice-maker, walk-in pantry, doorway to side patio and poolside terrace and a separate utility room with a washing machine and dryer. Stairs lead up to the impressive master double bedroom with fitted wardrobes and full en-suite bath/shower room with a heated towel rail. There is Duel Air conditioning/heating in all bedrooms the living room and kitchen. Superbly presented throughout with a wealth of beams, cooling terracotta tiles, Mediterranean pastal coloured walls painted in "Tierra Florestinas" style creating a delightful summer ambience. Another special feature of "Es Paradis" are the colourful mature gardens with winding pathways meandering through the lawns to various areas providing their own features. One area is shaded by scented pines providing welcome shade from the summer sun - ideal for afternoon siestas. Es Paradis also has an exterior heated Jacuzzi.an added bonus.